It's been a good while now since I put paint to a 18th century miniature. I've been painting plenty of figures from other periods, but this weekend I'm hoping to get cracking on the above. The photo is pretty awful (still getting to grips with this phone camera), but the figures in front are Ebor Miniatures WSS figures. First off, these figures are beautiful - brilliant sculpted by Paul Hicks, and well cast by Ebor (or whoever does their casting). On top of that, these miniatures are really good value at £1.10 a piece, and the fact you can buy them individually means that you're not buying miniatures that won't be used due to the way they're packaged. Altogether the WSS miniatures above make a 4 point Dutch force for the League of Augsburg's 'Donnybrook' rules. The figures at the back are conversions (and rather rough and ready ones at that). They were done nearly two years ago now, and are an attempt to turn some of the Perrys' AWI Queen's Rangers into Savolax Jagers for the Russo-Swedish War of 1788 to 1790. 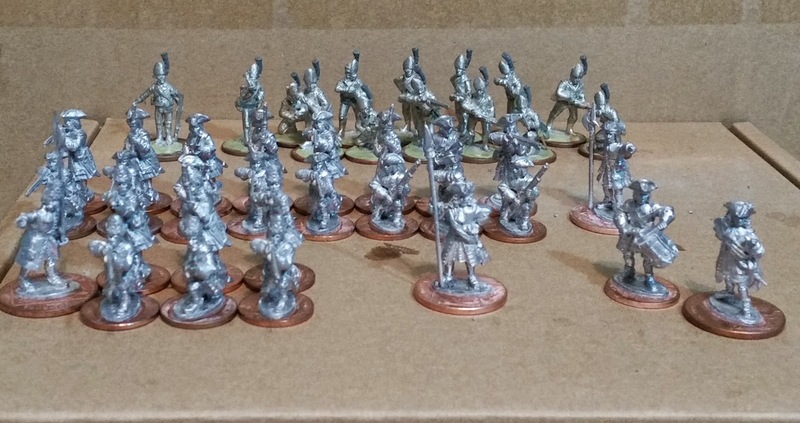 This little project stalled when I began to realise just how much work would be involved with the figures I was planning on using for the Swedish infantry. Recently, some new releases of figures and head sets have made the project much more manageable for a person like myself, with little in the way of conversion skills (and even less patience). The aim is to convert a small force for both sides of this somewhat obscure conflict, for use with the Lardies' Sharp Practice rules. Converting these taught me a couple of important lessons that will help me with the project - don't make a rod for your own back, and be prepared to settle for 'good enough'. I'll be undercoating all of these this weekend, but will probably only be making a start on the Dutch, due to not having suitable paints for the light green coats of the Savolax Jagers.